Recovery of transgenic cotton plants from tissue culture condition to greenhouse condition is a critical step for improving cotton through genetic engineering. Traditional methods always cause low survival rate of transplanted plants. In 1998, we developed an efficient grafting technique for recovery of transgenic cotton plants, which significantly increased the survival rate of the transplanting regeneration plants. 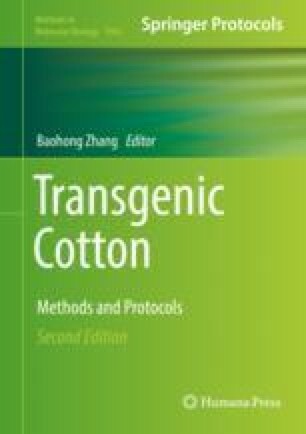 In this chapter, we present a detailed protocol for grafting transgenic cotton plants obtaining somatic embryogenesis and transgenics. Transgenic cotton Plant regeneration Graft Grafting Gossypium hirsutum L.